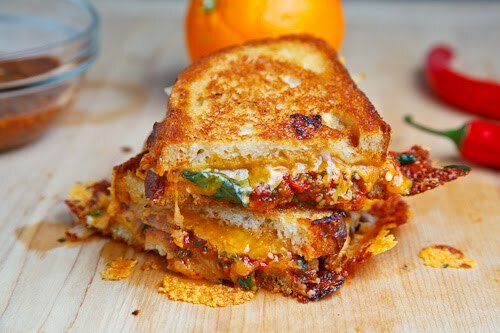 A tasty grilled cheese sandwich stuffed with tender bulgogi chicken, orange salsa and plenty of melted cheesy goodness. April is grilled cheese month and I wanted to squeeze in at least one more grilled cheese sandwich. 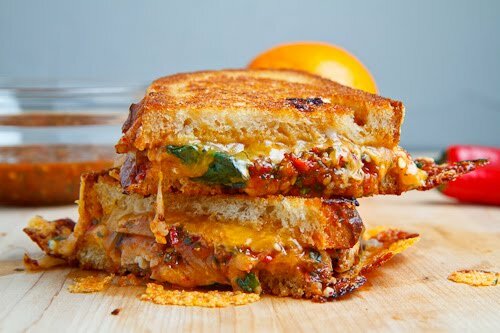 I am sure that a lot of you saw this coming but I had some of the amazingly good, sweet and spicy salsa naranja or orange salsa left and I pretty sure that it would make a fabulous grilled cheese sandwich! 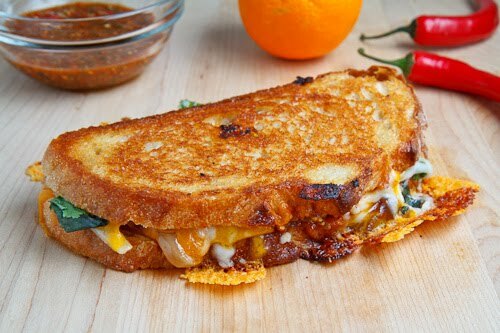 I have tried and enjoyed sweet grilled cheese sandwiches like the mango jam grilled cheese and I have tried and enjoyed spicy grilled cheese sandwiches like the buffalo chicken grilled cheese sandwich so I excited to try combining them in a sweet chili chicken grilled cheese! I started out with some of the leftover orange chicken bulgogi along with the orange salsa and the cheese and I added some extra fresh herbs in the form of basil and cilantro to keep with the Asian themes. I was not quite sure what to expect with this one but the results blew my mind; it was beyond all expectation! The Sweet and spicy orange salsa went so well with the plentiful mouth pleasing ooey gooey melted cheese and since the salsa is just packed with flavour so was the sandwich! The fresh herbs also worked really well in the grilled cheese and I will have to experiment with using them some more. If you don’t want to go to all the trouble of making the orange bulgogi chicken and the salsa naranja, I am sure that a version with plain leftover chicken and a plain sweet chili sauce would also be good! Add the onions and saute until they start to caramelize, about 7-10 minutes, set aside and reduce the heat to medium. Butter one side of each slice of bread, place one slice in the pan buttered side down, sprinkle on half of the cheese, then top with the onions, the chicken, salsa, sesame seeds, basil and cilantro and the remaining cheese followed by the remaining slice of bread, buttered side up. Cook until golden brown on both sides and the cheese is melted, about 2-4 minutes per side. Check out some more of The Best Grilled Cheese Sandwiches! This looks and sounds amazing! I like sweet and salty together, but I don't know if I'd have thought of them with cheese. Great idea. Asian twist with western classic is a comfort food for me. Great recipe Kevin! I'm also thinking some veggies sauteed in sweet chili sauce would be a fabulous addition to this! Love the idea of sweet, salty, spicy, AND cheesy all in one awesome sandwich! This sounds and looks amazing! What a great way to use up leftovers. But this just looks and sounds so good! That is what we would call "a hot mess" and in a totally good kind of way. I drool, I die, I make my way to the fridge in the hope of recreating the awesomeness that is this sandwich! This was made for me. Oh yum! I could so do with one of these right now. And I'm not even hungry! Thanks for the great recipe! I made this (with a few alterations due to lack of ingredients on hand), and it was delicious! My boyfriend, my dad and I all loved it. wow..v inviting..n tempting..thx for sharin!